If you’re interested in a day trip to Positano, you can spend a few idyllic hours eating lunch and browsing the boutiques on our Pompeii tour from Rome. For more guides, tips, travel hacks, and best-of lists, check out our Italian Travel Blog. One of the most picturesque towns on the Amalfi coast, Positano, Italy often is billed as the “Jewel of the Amalfi Coast.” Thanks to its setting on the Italian seaside, its precariously-perched pastel houses, and its church’s gleaming dome, Positano has charmed visitors for decades. Unsurprisingly, Positano is one of our favorite summer (or anytime) destinations in Italy. Want to make the most of your stay? Here’s our insider’s guide for what to see and do in Positano! (And for more tips on the Amalfi coast, don’t miss our posts on how to get to the Amalfi Coast and how to get THE MOST out of the Amalfi coast!). 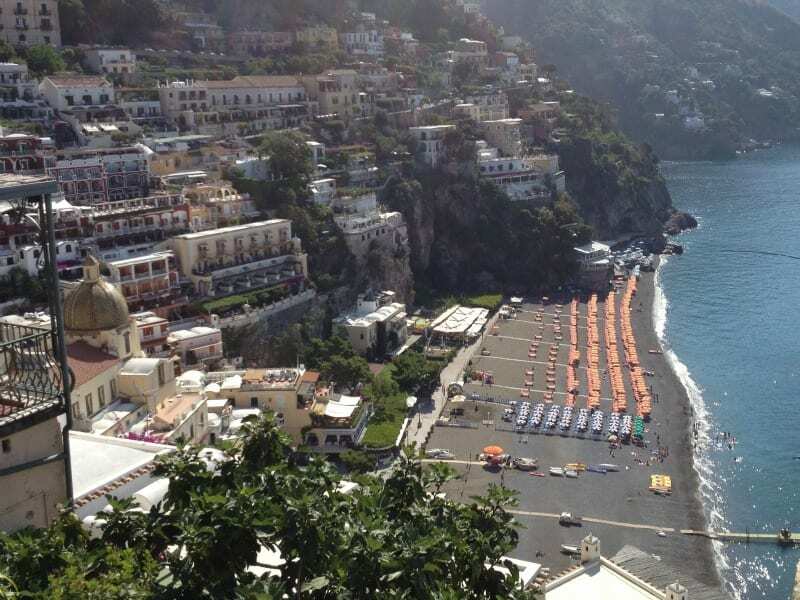 Spiaggia Grande… beach, and heart of Positano’s social life! You won’t find white, sandy beaches in Positano. IF that’s what you’re looking for, read our post on the best beaches in Italy. Positano has grey, pebbly sand, but that’s okay – with its beautiful, crystal-clear water and its spectacular setting, you won’t be paying attention to exactly what kind of sand you’re sitting on. The largest, and longest stretch is Spiaggia Grande—the place to see and be seen! Lined with restaurants, bars, and even a disco (“Music on the Rocks”), Spiaggia Grande is the heart of the Positano’s social life. Popular with tourists and locals alike, this beach is also where you can take in the entire view of the town… and it’s breathtaking! 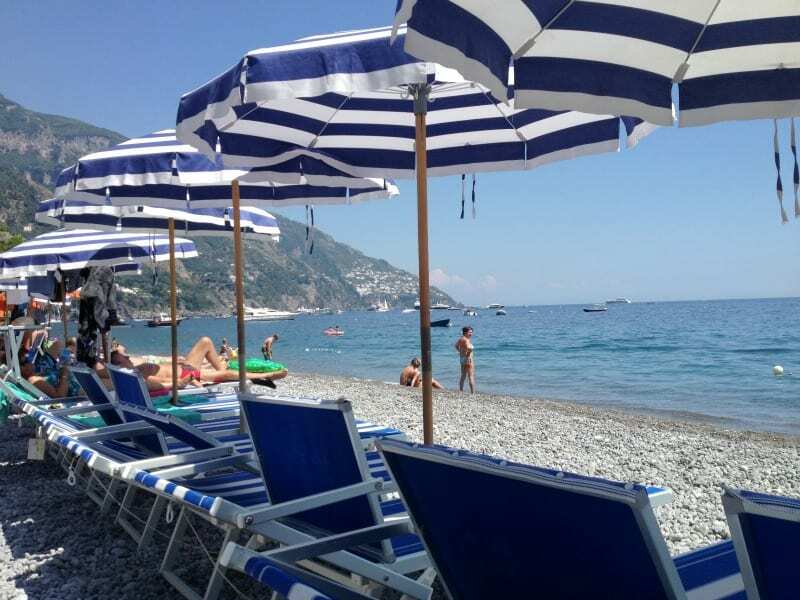 Insider’s tip: In general, beaches in Positano are run by private establishments offering sun loungers, umbrellas and facilities for a fee. On Spiaggia Grande, there is a section of beach—closer to where the ferries dock—that is free, so you can just lay down your beach towel. For those seeking more laid-back, tranquil beaches than the VIP scene at Spiaggia Grande, you’ve got other beach options in Positano. Fornillo beach, one of our favorite beaches in Italy, is a mere 10-minute walk along Via dei Positanesi d’America, the route that connects Fornillo and the main town. There is also a free boat shuttle to the beach from Positano’s main pier. Insider’s tip: This also is the beach to come to if you want the benefits of a private beach (like an umbrella), but would like to save some soldi: While the private beach on Spiaggia Grande charges €12.50 per person for the day, at Fornillo, it’s €7. And, at Fornillo, the establishments serve up some reasonably-priced and delicious dishes for lunch. Want to go further afield? Getting to the beach of Arienzo, situated 450 steps from the main road to the beach, can seem daunting. But there’s also a boat that can take you there from the pier in town! Another popular beach is Laurito, which also offers boat shuttles and is home to the famed restaurant Da Adolfo. Positano fashion: beach wear meets glamor! Love shopping? Then you’ll love Positano! While it’s not quite like shopping in Milan, the town proudly boasts its own thriving fashion industry. Positano fashion (moda Positano) is probably the most glamorous beachwear in the world. 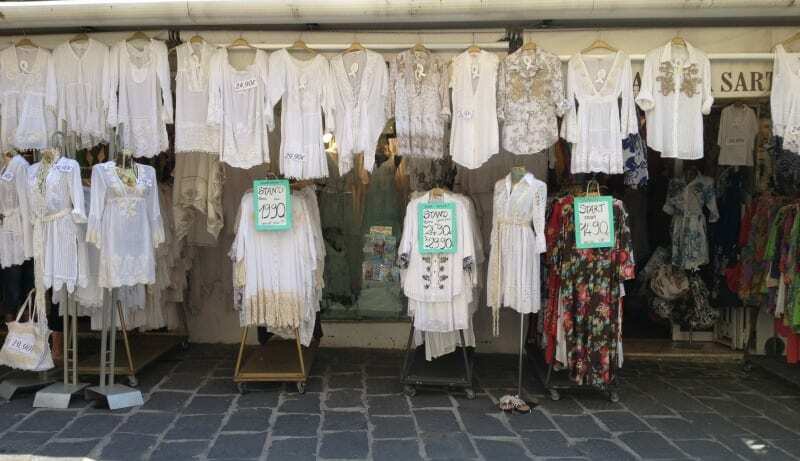 With its beginnings in the early 1900s and hugely popular since the 1960’s, Positano fashion is characterized by handcrafted clothes using light materials such as linen and adorned with macramé lace. 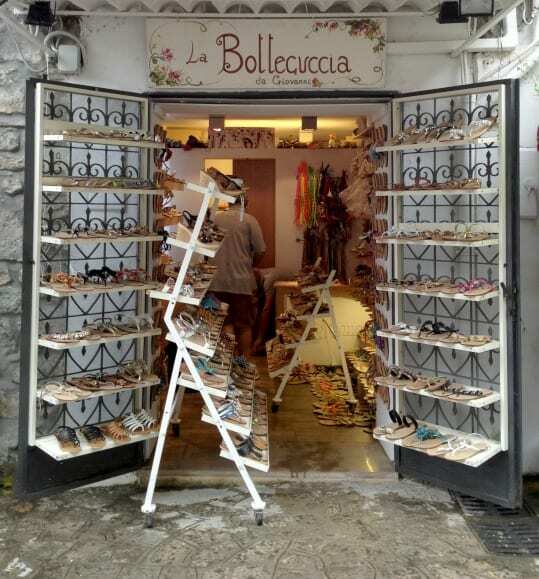 Stroll through the streets (at times more like stairs) and you’ll find no shortage of boutiques showcasing Positano fashion. Insider’s tip: For a dizzying selection of casual wear, drop by Antica Sartoria (there’s one location in Piazza Mulini, and another along the main beach). Looking for something more elegant? Pepito’s (at Via Pasitea 39) has you covered. The best Positano souvenirs for women? Handmade, leather sandals. Because they’re made on the spot, they can be designed as you desire (simple straps? Glittering gems? The choice is yours!). And you get to actually watch how these skillful artisans create a pair of sandals… uniquely for you. Insider’s tip: Stores selling handmade sandals are dotted all over town. Two of our favorites: the family-owned La Botteguccia on Via Regina Giovanna 19, and the small, discreet Safari on Via della Tartana 2. Average cost of sandals: about €60. From tabletops to tableware to tiles, these hand-painted ceramics, available in a gorgeous assortment of designs and colors, are made following centuries-old traditions. Most have their origins in Vietri sul Mare, another lovely Amalfi coast town. But many are sold right here in Positano. Insider’s tip: Ceramica Assunta on Via C. Colombo 97 boasts a huge selection of ceramics decorated with lemons, animals and intricate designs, making for the perfect souvenirs (or gifts!). So you’ve hit the beach… and done some shopping. What else is there to do in Positano? Eat, of course! The Amalfi coast is world-famous for its lemon groves, which bear gigantic lemons (some are the size of cantaloupes!). Have a sweet tooth? Don’t forget to try the delizia al limone, a treat made with a shot (or two) of limoncello, a famous local liqueur that you can learn all about in our blog post on limoncello. Made of sponge cake and drenched with lemon cream, delizia al limone is perfect for breakfast, tea… or, of course dessert. 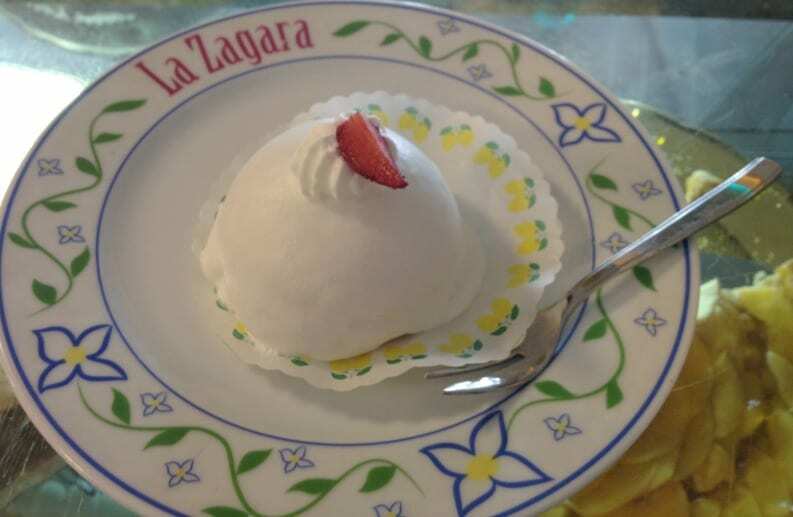 The best place to get a bite of this delight is at La Zagara (Via dei Mulini 8/10), a pastry shop with a drool-worthy window display. Then there’s torta caprese. We’ve mentioned that it’s one of the top things to try on Capri. Paired with a cappuccino, it’s the perfect way to start a day! Looking for more breakfast options? Buca di Bacco bar on Spiaggia Grande offers a variety of pastries from the fluffy brioche to the flaky shell-shaped sfogliatelle. And you really can’t go wrong as everything is delicious. Insider’s tip: To save money have breakfast at the bar, rather than sitting at a table, where you’ll get charged twice as much. 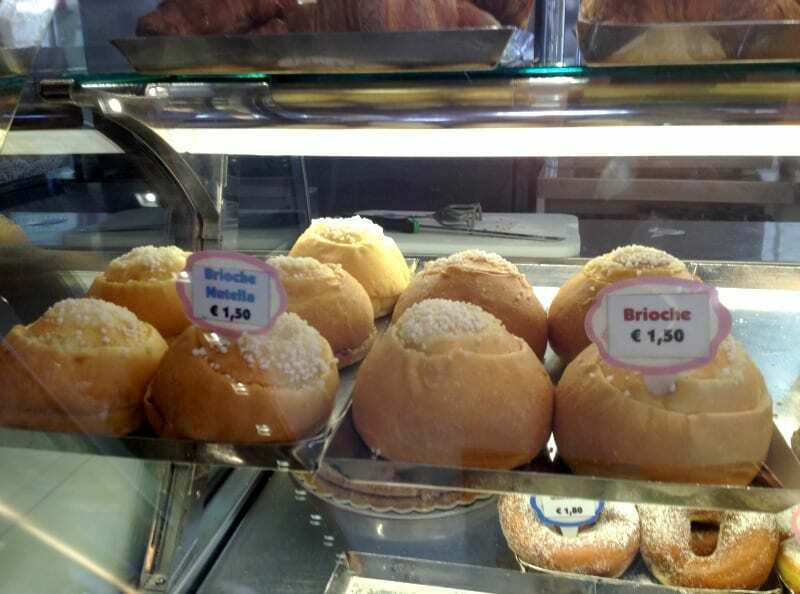 For more tips like this, check out our blog post on how not to get ripped off eating in Italy. Positano is wonderful. But the towns above Positano—especially Montepertuso and Nocelle—are also hidden gems, and well worth exploring! With only a handful of tourists around, these sleepy villages give you an authentic feel for everyday life on the Amalfi coast. In Montepertuso, you’ll see children playing soccer and residents sitting outdoors, while it’s eerily serene in Nocelle, a starting point for those hiking the Sentiero degli Dei (Path of the Gods). Even if you don’t plan on hiking the path, Nocelle still merits a visit for its striking views alone. For more on the Sentiero degli Dei and other paths, check out our post on the best hiking in Italy! Insider’s tip: To get to Montepertuso and Nocelle, you don’t need your own car; just take the bus from Positano’s Piazza dei Mulini. The bus schedule is displayed there, but to plan ahead, you can get one from the Tourist Office on Via del Saracino 4. Tickets also can be purchased in advance from these vendors. Alternatively, you can buy the tickets from the bus driver—it’ll cost more, but we’re talking 30 or 50 cents extra. Have you been to Positano? What are your favorite things to see and do? Let us know in the comments below. Must go to Cafe Positano- the best lasagna ever! Great balconies suspended from the restaurant- like a private room overlooking the sea view. Priceless!! Also try Da Constantino’s- Luigi the waiter was fantastic and their homemade Chianti wine for 7 euros was one of the best we had. Also note that there is a free (really!) shuttle from most hotels in Positano to the area restaurants. Villa Rosa is where we stayed and I highly recommend this resort. Maria at the front desk was so helpful and the hotel beautiful- room 32 is the best!! Ciao! I was there once, just because of the movie “Under the Tuscan Sun” – and I am going again in September – 9 days in Amalfi Coast staying in Sorrento. Italy is amazing, I have to go there every year or else I miss it! What a refreshing blog! We loved Positano. We stayed at Hotel Eden Roc in Septemeber of 2011. We stayed in a Junior Suite. The view was what dreams are made of! Invision…the beautiful sea and hillside of Positano…take me back. You must rent a scooter from Pepe’ We rented a mid size zodiac boat to explore the Amalfi coastline alone(it was unbelievably romantic to be in our own boat viewing the coast) We rented from Lucibello and it was so worth the money. I think it was around 100 euros per hour? Worth every penny. We (on a whim) could see the Faraglione rocks and decided to go to Capri in the boat. We will cherish the memories for the rest of our life! We are excited to be returning to Positano in 39 days! We fly from the US to Rome. We are staying at the L’Ancora in Positano as Hotel Eden Roc was booked. We are excited to experience our amazing view from L’Ancora as it is next door to Le Sirenuse. We are staying in Rome for 4 nights at the Rome Cavalierri Waldorf Astoria. We stayed there and once again…5 star all the way. We will be staying in Capri at Casa Morgano for 3 nights. We have never stayed in Capri so we hope it is as magical as all of our other vacations. We are taking the train from Rome-Salerno and the Travelmar ferry to Positano. We followed this itinerary in 2011 and I found it to be by far the easiest way to economically get to Positano. Traffic is so slow on the coast that even hiring a private driver will not give you the magical view of coming into Positano from the boat and you’ll travel probably just as long. The Salerno train station is about 6 blocks from the Travelmar dock. We had 2 large suitcases and we found it to be a relatively easy walk. Anyway…thank you for your amazing blog. I can’t wait to read all of your posts!!!! Thanks for your kind words! It sounds like you have a lovely trip planned to Positano and Capri—enjoy, and let us know if we can help with anything at all! Thanks for stopping by! Hi Brenda! We definitely recommend heading off the beaten path and generally steering clear of shops and restaurants in the main square as they tend to be more expensive. A great souvenir from Positano is artisan made sandals, which you will find on many of the small streets. 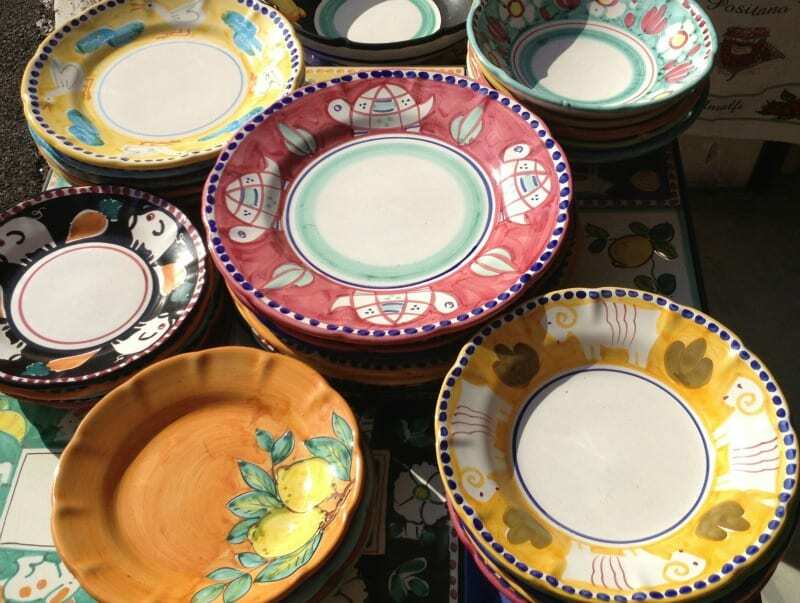 We think you’ll like the decorative handmade plates, too. One of our favorite restaurants is Da Adolfo near the beach with wonderful fresh fish specials. Buon viaggio and let us know if you have any questions! Wooow what an amazing review! My husband & I are planning a trip to amalfi & capri by july next year so where would be the best place to stay in amalfi ? I had in mind Ravello but then every other village is just as stunning which makes it very challanging to pick one over the others!! We are looking for sea view, clean & cost effective place .. any Idea? Also approximatly we will have only 11 days so how do you think should we split it between capri & amalfi? Ciao Layla! Have you considered Salerno? It’s a wonderful option for the Amalfi Coast. You can read more about why we love it as a base here. Let us know if you have any questions! I stayed in Positano in July, 2013. The experience was fantastic! In fact, I’m going to Sorrento then Positano again this July. Some more tips for Positano–the lemon slush cart in Piazza dei Mulini, a summer series show in Ravello, a simple boat trip to Amalfi and back to Positano, definitely Spiagga Fornillo, definitely a cafe at La Zagara, and a stay at Hotel Palazzo Murat. We plan on visiting the Amalfi coast around the 23rd of August and are on a budget with 4 adults and 4 kids ages 7-18. Any recommendations on how to spend a day there and where to spend the night? This post on the different towns of the Amalfi Coast can definitely help you decide where to spend the night. As for what to do, we suggest getting the most of your time with an expertly guided tour! Kids will love exploring the ruins of Pompeii, the city preserved under the ash of a volcano, on our small-group, inexpensive day trip. 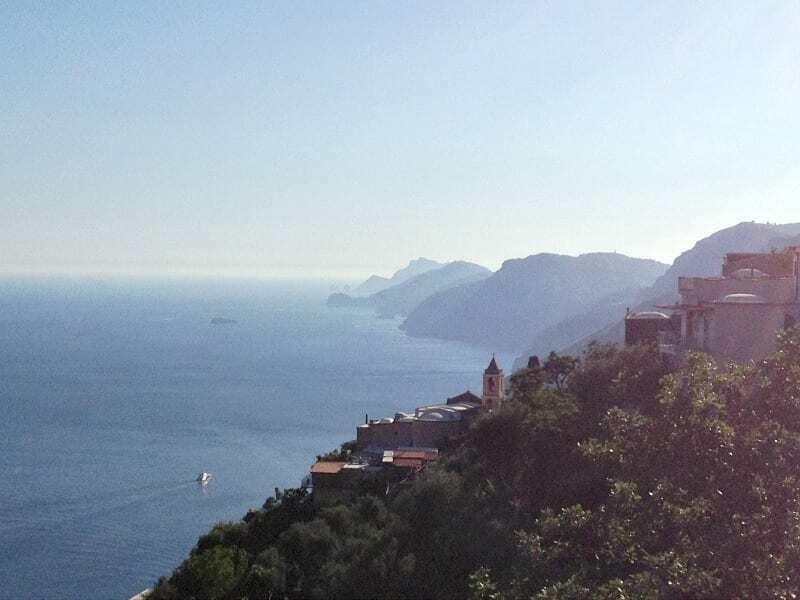 Or, take advantage of the incredible summer weather with a day trip to Capri Island from Sorrento. We will be in Milan for 4 nights.Arriving 10 February 2018. Then we want to visit Cinque Terre for 4 nights. Where is the best place to stay in Cinque Terre. Then we want to go to Sicily – Palermo for 4 nights. What is the best way from Cinque Terre to Palermo. Then we want to stay 4 nights in the Amalfi Coast. Where is the best place to stay in the Amalfi Coast to be central to visit all the towns. We will depart from Rome . Is it wise to do 4 nights Palermo. Will it cost too much or should we stay longer in other parts. Please advise. I do not know what to do. Where you stay in Cinque Terre is quite indifferent — all the towns are beautiful and all so near you could walk from one to the other! We’d suggest flying to Palermo, there’s an airport in Pisa, quite near to Cinque Terre. To choose where to stay along the Amalfi Coast, check out our article The Best Amalfi Coast Towns for Every Type of Traveler. What is the best/most luxurious hotel in Positano? Also, is it easy to get to Capri from Positano? What’s the best hotel in Capri? Which should we stay at? Unfortunately, we’re not in the accommodation business, but maybe some of our readers will see your comment and can share! If not, try searching online at sights like Booking.com.